David Weiss Halivni began work on his Talmud commentary, Sources and Traditions, in 1968 with the publication of a volume on Seder Nashim. In the forty-five years since, Halivni has published an additional seven volumes, covering Seder Moed and Seder Nezikin. In 2009, Magnes Press published a separate volume containing a collection of all of the introductions to Sources and Traditions extant at that time. While most of Halivni’s introductions are 10-15 pages in length, two factors precipitated the publication of a separate “introductions” compilation volume. 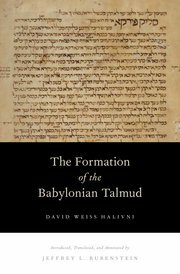 First, Halivni’s nearly 150 page introduction to his commentary on Baba Batra (2007) programmatically presents an organized and complete, if not final, formulation of Halivni’s ideas about the formation of the Babylonian Talmud. Second, the fact that Halivni has slowly refined his position on this matter over a forty-five year period called for a single volume that demonstrated the evolution of his theory. Jeffrey Rubenstein’s translation of Halivni’s introduction to Baba Batra, The Formation of the Babylonian Talmud, is important because it is here that one sees a dramatic shift in Halivni’s thinking about the process of the construction of the sugyot in the Bavli as well as in his historical conception of how the Bavli reached its final form. In short, Halivni modifies his earlier theory and now argues (1) that the Bavli took far longer to form than he had originally thought; (2) what he originally thought to be the Stammaitic era in fact consisted of multiple phases; and (3) the Saboraim lived at the end of the eight century. Though Halivni often reflects on how he came to his current theory about the formation of the Talmud and why he has altered positions he in the past advocated, Halivni’s readers might be encouraged to wonder how Halivni would read his own text using the methods he applies to the Talmud. Much like the Talmud, many of the ideas Halivni presents in this book are either interdependent, dependent on ideas presented later in the book, or dependent on ideas presented in previous volumes of Sources and Traditions. Therefore there is a lot of repetition of ideas formulated in different ways throughout the book and argued for with different proofs in each instance. In fact, Halivni presents his argument counter-intuitively not according to the historical chronology of the development of the Talmud but rather according to the chronology of the evolution of his theory. There are myriad references to individual insights drawn from individual Talmud passages discussed over a forty-five year period in Sources and Traditions, at times with whole-scale transpositions of up to several pages. Not only do we have the sources before us but Halivni also reveals his process. Halivni’s theory developed with Sherira’s Gaon’s letter on the evolution of Oral Law (c. 1000) as his starting point. Sherira is the mountain Halivni must overcome, especially Sherira’s understanding of Baba Metzia 86a, that with Ravina and Rav Ashi the Talmud came to an end (sof hora’ah). According to Sherira, the Talmud developed in the Amoraic period in layers, one generation at a time. The anonymous material found in the Talmud represents the unanimous positions of the academy in each generation. After the close of the Talmud, around the year 500, Saboraim contributed brief explanatory glosses to the text. According to Sherira, the Saboraim lived for a short period until the start of the Gaonic era in the year 589. Halivni rejects Sherira’s description of the development of the Talmud outright for the following reason, which is the basis for Halivni’s commentary on the Talmud. The Talmud is replete with forced explanations. These forced explanations can be explained once one understands that whoever supplied them did not have access to the accurate original sources. These sources can be reconstructed by appealing to parallel sources. The Stammaim, who supply both the anonymous content and the dialectic portions of the Talmud for each sugya did not have access to these parallels, but now we do. From here, Halivni begins to write a commentary that explains a series of sugyot according to his method. This commentary spans forty-five years and thousands of pages. Along the way, some conclusions he has drawn from the sugyot he has analyzed force him to reconsider Sherira’s description of the Saboraim and the time in which they were active. Yet Halivni moves slowly and cautiously through this minefield. In Midrash, Mishnah, and Gemara (1986) he writes, “with respect to the time when the period of the Saboraim began, as well as what happened during that period, I do not dare diverge from R. Sherira’s chronicle. We are totally dependent on him—the oldest and most classical historian of the Talmud—for the history of the Saboraim.” (140) Although by the time he writes The Formation of the Babylonian Talmud he has rejected both Sherira’s account of the evolution of the Oral Law and his timeframe for the Saboraim, Halivni still feels compelled to organize his theory around their existence and Sherira’s description of their function. Yet they constantly get in the way. One is left to wonder how Halivni’s theory would change if he were to wipe the slate clean of R. Sherira’s letter and re-develop his theory from scratch, only using the internal evidence of the text, a method he actually argues for at the outset (11-12). The fact that it took Halivni so many years before incorporating the work of Transposers and Compilers (see below) into his formation theory demonstrates his bias for moving outward from Sherira and the sugya rather than inward from the evidence of the Talmud alone. The problem with this approach is that it is more likely that Sherira’s understanding of the development of the Talmud is derived more so from his reading of the Talmud (and earlier texts such as seder tannaim) and earlier Gaonic sources than from an accurate tradition that goes back to the talmudic era. Halivni himself comes to this conclusion, albeit slowly. So why not simply ignore Sherira’s identification of the Saboraim with a particular literary activity? Why not simply assign the Saboraim the function he assigns the Stammaim and extend their era? It seems that a scanty few occurrences of minor anomalies, like the handful of times names are found both in Sherira’s Saboraim list and the Talmud, have forced Halivni to push his dating of the end of the Amoraic period back fifty years. Additionally, Halivni makes much to do of Sherira’s attribution of a passage in the Talmud to Huna Gaon (29-34). On the one hand, one is left with a sense that Halivni cannot completely disentangle himself from Sherira’s letter despite recurring arguments that one must look only at the evidence of the Talmud for formulating a theory of its formation (220-221, n.82). On the other hand, a lull at the end of the Amoraic period, where for fifty years not much happened, does provide the historical space Halivni needs to establish his overall theory. If the Amoraic era was still alive from 500-550, but in sharp decline, then it is easy to imagine that the dialectic argumentation of earlier Amoraim was forgotten during this period. Halivni’s theory can be summarized as follows: Much like in the time of the Tannaim, the Amoraim formulated apodictic statements in the form of “So-and-So said such-and-such.” These Amoraic formulations were originally based on dialectical argumentation. The Amoraim, however, did not transmit their dialectics but rather just their conclusions. Professional Reciters memorized the apodictic statements and were available for consultation, but there was no official transmission of dialectical argumentation. The apodictic statements were transmitted independently of the Mishnah and circulated in non-canonical loose collections. By the time of Rav Ashi (c. 430), the production of apodictic statements by Amoraim had slowed down and had come to an almost complete halt by the time of Ravina II (c. 500). In Halivni’s scheme, the Amoraic period continues for another fifty or so years and we do find the occasional name of someone who lived during this period in the Talmud (such as Rav Ravai of Rov, who appears both in a version of the Talmud quoted by R. Hananel and in the letter of Sherira Gaon.) At this point, in the mid-sixth century, the period of the Stammaim begins and it is the Stammaim who are responsible for both the anonymous content of the Talmud and the form of the sugya. Whereas in earlier iterations of his theory Halivni believed that the Saboraim lived between the period of the Amoraim and the period of the Stammaim, he now argues that the Saboraim lived at the end of the Stammaitic period, close to the time of Yehudai Gaon (c. 770), when independent Rabbinic authors begin to produce works of their own. The next period is that of the Compilers. The Compilers organized all of the material of the Stammaim into their proper place within the Talmud, by tractate and by Mishnah. Early Compilers felt they were still allowed to incorporate added dialectical argumentation in order to make the material fit in its new context. In this way they also could be considered part of the Stammaitic period. Later Compilers, however, simply put material in its place without attempting to make the text conform to its new context. The final category that Halivni introduces is Transposers. Transposers move material from one place to another. So, for example, if Rava says an identical thing in three places in the Talmud, then the reality is that he only said it once but someone transposed his statement to the other two locations. This category is perhaps the most complex and difficult to pin down. Halivni details five different types of transpositions and argues that Transposers operated from the beginning of the period of the Stammaim, through the Saboraim, and even during the Gaonic era. Throughout, Halivni provides examples for each step of his argument. At crucial moments in his argument he provides multiple examples to prove a point. So, for instance, Halivni provides six examples of how the assumptions behind the argumentation of two Stams located on the same folio are incompatible (67-85). This is a very powerful argument for both his theory that the Stammaim and Compilers performed different tasks at different times and his argument that the Talmud never had a general editor. Though one might on a local basis take issue with each and every one of the arguments and examples upon which Halivni builds his theory it is quite important to bear in mind that in order to topple his theory one must contend with the sixty pages of footnotes pointing to hundreds of examples strewn throughout his commentaries to three orders of the Talmud. Few scholars have actually endeavored to posit a realistic, comprehensive theory for how the Talmud was formed. Though Halivni’s theory might contain lacunae and minor flaws, (xxvii-xxix) it is still the most complete and convincing account to date. In his translator’s introduction, Jeffrey Rubenstein outlines what is missing from Halivni’s account of the Talmud’s formation. First, Halivni does not deal with the aggadic sections of the Talmud, though these sections comprise nearly one third of the Talmud “and much of it is unattributed.” (xxviii) Second, Halivni makes no use of the recent scholarship on Zoroastrian religion and Sasanian culture in formulating his theory. Third, how did the Arab conquest (c. 630-650) effect the formation of the Talmud? The conquest, after all, represents a major political and social upheaval, one that occurs right in the middle of Halivni’s account. Rubenstein also points to the fact that Halivni, though cognizant of the oral culture of the Talmud, still does not make use of scholarship on the “mechanisms of textual production and editing in conditions of orality.” (xxix) I often wonder if Halivni’s reconstruction is really too centrally derived from methods that originated in the study of the development of written textual traditions. In addition to what Rubenstein has noted is missing from Halivni’s account I would like to add the following. No mention is made of the reason for Abaye and Rava’s prominence in the Talmud, or of the nature of their debates as they relate to the sugya’s (re-)construction. Additionally, Halivni speaks of the transposition of named statements, sentences, or paragraphs from an original to a secondary sugya but not of the transposition of individual words. I believe that a major factor in the Talmud’s formation and resultant semiotic system stems from the transposition of individual words from one sugya to the next. The Talmud is replete with occurrences of clusters of rare words, a literary feature of the Talmud that can only be explained through transposition. These types of transpositions do not stem from any of the factors Halivni addresses. Additionally, the possibility of bi-directional transpositions from a secondary sugya back to an original one does not make its way into Halivni’s theory. Finally, since Halivni’s theory is driven by logical concerns, his work does not elicit the types of conclusions that Jeffrey Rubenstein is able to draw out in his own work on the Stam of the aggadah. Rubenstein demonstrates that, by reworking sources, the Stammaim reveal to us important information about their culture. Since, for Halivni, the Stammaim are merely trying to reconstruct the lost original argumentation of the Amoraim, there is not much room in his theory for a cultural explanation for the changes that take place between an understanding of an original source and a later misunderstanding of that source. With that said, one cannot underestimate the scale of what Halivni has accomplished in detailing his theory. Rubenstein explains why Halivni’s “debate partners” are scholars of previous generations (xix). The sheer magnitude of the material that one must master before attempting a grand theory of the Talmud is mindboggling. What Halivni has produced for us is more than secondary academic writings on the Talmud. Future scholars will have to contend with Halivni’s work in the manner he has with Sherira’s letter, as a primary source containing ideas that must be thoroughly explored before positing something new. This volume was translated not by an anonymous translator, but by one of the most well-respected American Talmudists, Jeffrey Rubenstein. The translation should thus be seen not only as a moment to celebrate the contributions of Halivni to the field of Rabbinics but as a time to reflect on Rubenstein’s as well. Rubenstein has almost single-handedly taken upon himself the task of making Talmud accessible and enticing to readers ranging from the uninitiated college student to the non-Hebrew speaking scholar and beyond. Whether it is through his translation of—and brief commentary on—the Rabbis’ “greatest hits” (Rabbinic Stories), his work on the aggadic Stam (Talmudic Stories and Stories of the Babylonian Talmud)—again, a marked lacuna in Halivni’s work – or his compelling reconstruction of The Culture of the Babylonian Talmud, Rubenstein is virtually without peer in clarity of expression and precision of method. Zvi Septimus is Anne Tanenbaum Post-Doctoral fellow at the University of Toronto. He was previously Alan M. Stroock Fellow for Advanced Research in Judaica at Harvard University and received his PhD in Jewish Studies from UC Berkeley. The problem may not really be overcoming Sherira’s Gaon’s letter, but it having been accepted and virtually given the effect of “core belief” by Rashi’s incorporating it into his commentary on the Bava Metzia 86a reference. The suggestion is then that R Weiss’ position should be restated in the form of a Tosehos comment on Rashi, using that material which was available at that time. After all, the main argument which R Weiss poses against what he views as the misinterpretation of BM 86a is based on the term “hora’ah”, and the sources he cites were all available at the time. I just happened to see the statement on page 65 (English version) that the Yad Malakhi cites the Shita Mequbetset on BM 9a with the parenthetical note [though I could not find the reference in Ashkenazi’s commentary there]. The reason for that is that it’s not on BM 9a but BM 2b.